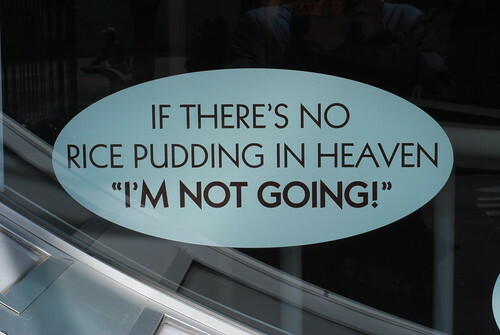 I’ve been hearing about Rice to Riches, a place that only serves rice pudding, for years. 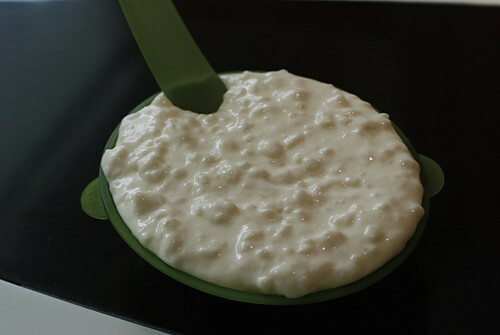 As a big fan of rice pudding, I don’t know why it took me so long to go. I was hoping to sample a few different flavors, but even the smallest bowl is plenty big enough for one person. I wasn’t sure which to try, since they all sounded so good — “Man-Made Mascarpone (with Cherries),” “Old Fashioned Romance (Traditional),” “Perfectly Legal Pecan Pie,” “Fluent in French Toast”… I asked the woman behind the counter what she recommended, and she recommended three more. I took one of her recommends — the “Almond Shmalmond.” $6 gets you a “solo,” a bowl filled to the brim with rich, creamy rice pudding. The almond flavor came through nicely, and I ate it very quickly (even if I did feel like a bit of a doofus eating with the oddly shaped disposable plastic utensil).